As the only legitimate heir of England’s King William (Jim Broadbent), teenage Victoria (Emily Blunt) gets caught up in the political machinations of her own family. Victoria’s mother (Miranda Richardson) wants her to sign a regency order, while her Belgian uncle (Thomas Kretschmann) schemes to arrange a marriage between the future monarch and Prince Albert (Rupert Friend), the man who will become the love of her life. I love love love The Young Victoria. Seriously, I can’t stop smiling whenever I watched this film. I know The Young Victoria is an old film. Well, 8 years ago is kind of old, you know. But no matter how many times I watch this film, I still love it. That is why I decided to write the review. I love the story, I love the clothes, the settings, everything about The Young Victoria! Emily Blunt played the role of Queen Victoria wonderfully. I was surprised she wasn’t nominated for Oscar for this role but I am glad she is nominated for Golden Globes, though unfortunately, she didn’t win it. Seriously, she was very good in playing the young Queen Victoria. Her attraction towards Rupert Friend, who played the character of Prince Albert, is somehow looked real. It’s like watching the real Queen Victoria and Prince Albert. Not that I know of them in person, but I’ve read about them many times. Some said that true love is Romeo and Juliet who died together, but the truth is, true love is watching grandmother and grandfather grow old together. Yes, that version of true love is more possible and makes sense. However, to me, true love like Victoria and Albert is more epic. Even though Prince Albert died at the age of 42 and he only had been with Queen Victoria for 21 years. Since the death of Prince Albert, Queen Victoria only wore black dresses and gowns. She also insisted that all Albert’s rooms, in all the royal residences, should be kept as they had been at the time of his death, the linen is changed each day and hot water is brought in as though Albert were still alive to bathe and shave. Fresh clothes of Albert’s were laid out every day as well, until her death at the age of 81. We all know how much Victoria relied on her husband so much and how devoted Albert was to her wife. He had helped her reigned. She said, “There is no one to call me Victoria now,” and wept. Well, we can conclude that Prince Albert is Queen Victoria’s companion, father of her children, best friend, confidant, unofficial private secretary, and the love of her life. Okay, now I’m straying off topic. Let’s get back to the review here. So, Emily Blunt and Rupert Friend, their chemistry is undeniable. They really convinced the audience that they indeed are in love. The way they gazed each other, smile at each other, and talk to each other, it’s undeniably sweet and heart melting. I really love the scene during their first dance. Somehow, I love when people doing the waltz. Like when I watched Crimson Peak (2015), the dance scene is my favourite part. In The Young Victoria, the dance scene is also one of my favourite scenes. It looks beautiful. They look beautiful, seriously. The song is also very beautiful. The dance scene of Queen Victoria and Prince Albert is perfect. 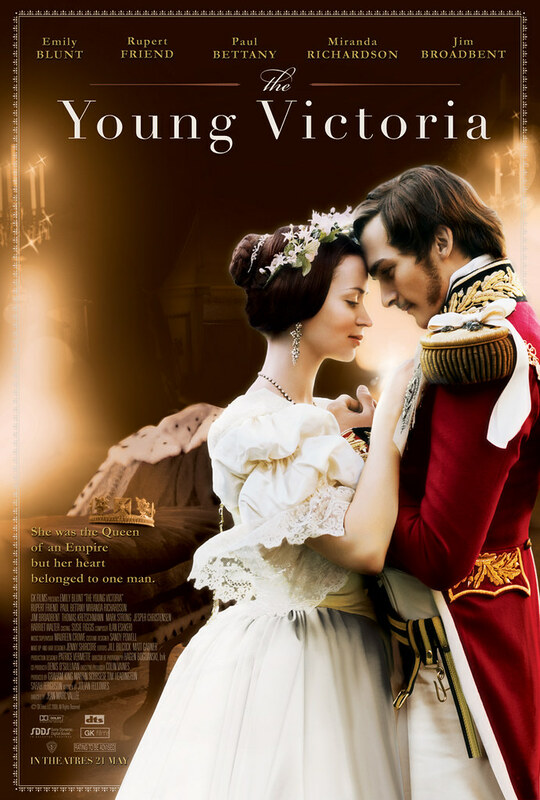 The Young Victoria is worth to watch especially when you like the story of Queen Victoria and Prince Albert. I’m not a film critic so I’m not that good at what has to be described. But The Young Victoria is a good film with good casts, good story, good setting, and good costumes. We’ve got the chance to see the earlier reign of Queen Victoria and her encounter and marriage with Prince Albert. Though the story of their marriage in this film isn’t quite long, we are shown how their marriage would go and how it was started and that’s enough to know that their love story was epic. We’ve been shown how Prince Albert loved Queen Victoria and vice versa. Both Emily Blunt and Rupert Friend have succeedingly made their feelings to each other looks real. It’s like seeing the real Prince Albert and Queen Victoria fall in love all over again. Their acting skills are awesome. That is why I am surprised Emily Blunt wasn’t even nominated for an Oscar for this film. I know it’s nothing like Eddie Redmayne in The Theory of Everything (2014) or The Danish Girl (2015), but I do think Emily’s acting skill is something to be reckoned with. Anyway, I like her no matter what. Her acting skill is great and if Alicia Vikander can get an Oscar for her role in The Danish Girl, I think Emily Blunt should also get one for this role. Anyway, it was a long time ago and I can’t even change anything since I can’t turn back time nor I am one of the Academy members. Aside from Emily Blunt and Rupert Friend, the other actors and actresses also have done a great job. Jim Broadbent as King William is funny. I don’t know if the real King William acted like the way he did but Broadbent’s King William has his own charm. I’ve always recognised Paul Bettany’s voice as Jarvis in Iron Man films and The Avengers films. To see him as an anti-hero here, rather than the usual hero, is actually not that bad. His acting is indeed very good. In summary, The Young Victoria is an excellent film and worth to watch. Especially to you who love a love story and a history or biography film. The setting was great, the costumes too. The story between Queen Victoria and Prince Albert also very interesting and sweet to watch. Their love story is really epic. The Young Victoria receives 8.5 out of 10 stars from me.